Windsor is a town and parished area in the Royal Borough of Windsor and Maidenhead in Berkshire, England. It is widely known as the site of Windsor Castle, one of the official residences of the British Royal Family. 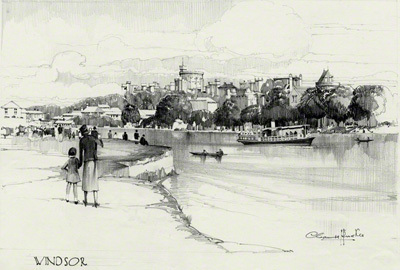 Claude Buckle captures the view in the pencil drawing looking south across the River Thames. Created in 1935. View of Windsor Castle from the air. The drawing is looking from the top left hand corner of this photograph.